The western world is no stranger to chai. 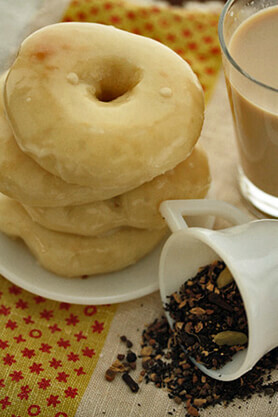 Chai has been popularized in coffee shops all over as creamy, spiced, black tea. Kashmir’s take on chai is slightly different. There are 2 major types of tea beverages, Sheer Chai and Kahwah Chai. Both are an important part of Kashmiris’ daily lives. Kahwah, sometimes spelled Kehwa or Qehwa is somewhat like the sheer chai, without milk and salt. It is a green tea enjoyed spiced and sweet. It is particularly popular among the Kashmiri Pandit community. The type of tea used for this beverage is also a particular green tea specific to the region, but its taste can be somewhat approximated by using gunpowder green tea. Bring the water, cardamom pods and cinnamon to a boil. Add the tea and saffron strands and let steep for about 5 minutes. If you are using saffron powder, simply dissolve the powder in some water before adding it to the water. Remove the tea leaves and add sugar to taste. Place a portion of the crushed almonds in each serving cup (makes roughly 4 servings). Pour the tea into each serving cup, over the almonds.